SALE! ONLY $5.00! Womens V-neck sport t-shirts. Available in these sports only as pictured, in sizes Small - 2XL. 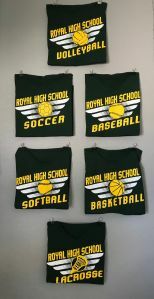 Please call Student Store at 306-4875 x2741 to confirm your size and sport style is available before purchasing.